As a savvy Ron and Lisa reader, you’re likely already aware that with green construction and tighter homes being built, we are constantly breathing in dangerous particulates and toxins; creating a toxic brewery of sorts. While we can’t always smell or detect the chemical pollutants that come from gases, cleansers, materials and biological agents such as mold, viruses, pollen, dust mites and bacteria –it doesn’t mean they’re not there. Exposure to theses contaminants can lead to asthmatic triggers, respiratory ailments, dizziness and other illnesses. Introducing an easy way to clean and purify your air with the patented, multi-stage WAVE Air Purifier. It utilizes a highly rated HEPA filter for filtering particulates; a unique Ultra Violet superior purification; and multiple-processes to remove and kill 99% of everyday indoor air pollutants. Covering 800 square feet, it’s portable and can moved from room to room or taken to a new residence. The Same Technology that Hospitals Trust! 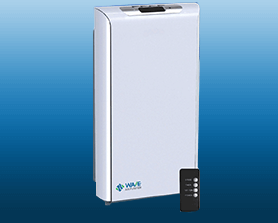 UV (ultraviolet) technology used in hospitals is incorporated into the WAVE Air Purifier. It utilizes a patented, revolutionary dual UV wavelength and reflector not found in other UV purifiers. Coupled with a high-end HEPA filter and multi-stage processes, the WAVE Air Purifier gives you superior purification, killing up to 99% of everyday indoor air pollutants. Glad you asked! The WAVE Air Purifier has a CADR (Clean Air Delivery Rate) of 150! Plus, the Smart Sensing Technology continually samples and monitors the air, automatically controlling the unit’s operation. If pollutant levels start to increase, the unit will self-adjust and operate at a higher speed until conditions are favorable. The WAVE Air Purifier has a super smart automatic indicator for UV and HEPA replacement. But, you’ll replace the filters approximately every 2 years –or – 17,500 hours of operation. WATCH the WAVE in action now. Sit back. Relax. Breathe. Will you be the insanely lucky winner of the WAVE Air Purifier valued at $645.00? Enter daily for a chance to WIN and share this page a friend or loved one who could benefit from clean, healthy and purified air! For every action below that you complete, you receive a specific number of entries. Click each individual action to enter yourself. For actions you have done in the past (i.e. you are already a fan of WAVE Home Solutions on Facebook) just click directly on ‘I did this’. The eligibility of the winner will be verified by The Healthy Home Dream Team®. There is no mandatory entry. Each action will earn different numbers of entries into the contest. You may Tweet or share on Facebook or Google+ for an entry once per day. All other actions will only be counted once. Sweepstakes open to US residents age 18 and over. Contest ends 11/7/15 at 12:15am PST. 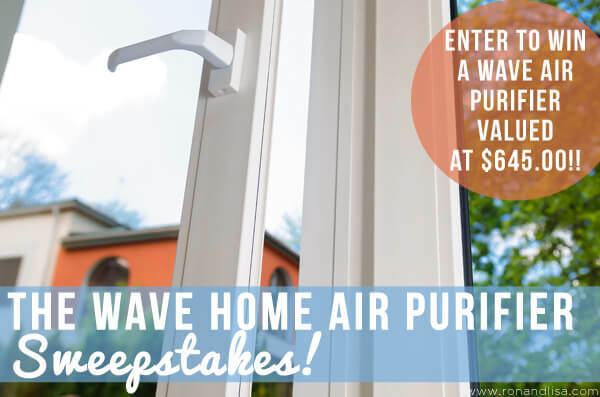 I would love to win the WAVE home air purifier! The portable air purifier ~ we all suffer from allergies in our home, even the dog! I love that it removes musty odors and moisture in a room. My favorite feature is the Smart Sensing Technology that allows for the constant monitoring of the air. the portable air purifier looks great! I would love to own the Wave Ventilation system. Thank you again for the amazing win! You’re SO very welcome Stephanie!! We hope (know) you will enjoy your new WAVE Home Air Purifier! Drop back and let us know how you like it. We’re thrilled it will help you & your kids breathe better, safer and cleaner air! new wave techs? how it works compearing to HEPA?